Hi Peeps! I’m in the mad dash of the final prep for Hobnob Market NEXT WEEK! EEEEKKK! So exciting and so much final prep to do! 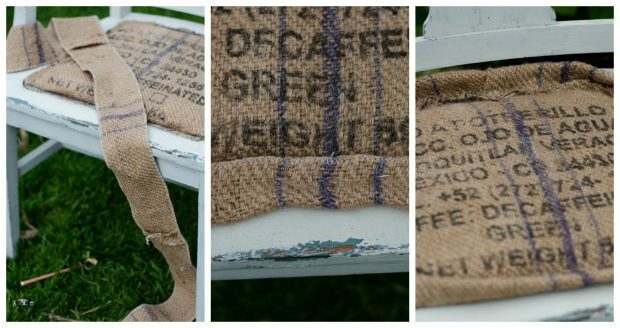 I thought I was going to have to let this months Project Challenge slide but at the very last minute I threw a burlap seat on a chair. A chair that has been sitting in my living room for at least 2 years. I painted it. And had good intentions of getting a new seat in it. But good intentions many times stay just that – intentions. Plus the chair looked rather cute tucked into the corner of my living room. I draped a blanket across it or propped a pillow in it and left the seat makeover stay at the ‘intention’ level. A few weeks ago I pulled the chair out of the living room and said, ‘It is high time to finish this thing and take it to Hobnob Market. Since then it bounced around in my work room, getting shoved around and piled high with ‘stuff’. Until it hit me that I COULD finish that chair, getting it ready to sell at Market, AND complete my Project Challenge too! Hence, my Burlap Chair Seat Makeover – cause our item to use this month is Burlap or Ticking. At first I thought I’d use some ticking. 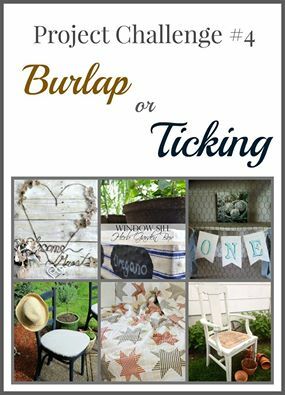 But the ticking didn’t match the paint job as well in person as it did in my head so I switched to using burlap from a cool old burlap bag I just happened to have in my stash. The printed side worked great for this seat. So – wanna see how I did this? Come along and I will show you! 1. 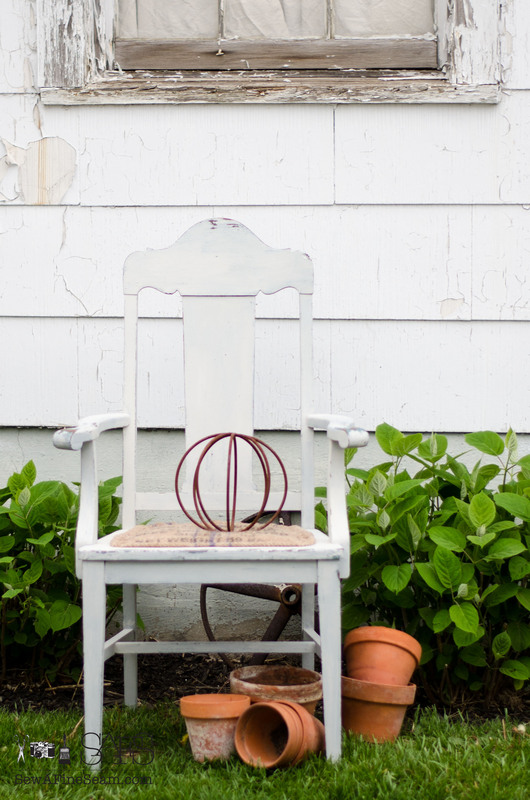 Turn chair upside down and staple strips of upholstery webbing across seat opening, weaving it to make it stronger. My hubby helped with this a bit to get the webbing pulled as tightly as possible. 2. Turn chair back upright and fill seat area with batting. I used cotton quilt batting sheets because it’s what I had on hand. I used a pencil to draw around the edge of the seat and cut a pattern and then cut 15 more sheets to get the thickness I wanted. 3. Tuck batting into seat opening . 4. Cover batting with burlap (or your chosen fabric) and staple in place. Now it’s time to cover up those staples. I thought a bit – the easiest way is to hot glue piping or trim over the stapled edge. I didn’t have any trim I wanted to use and I shuddered to think of making piping out of burlap. 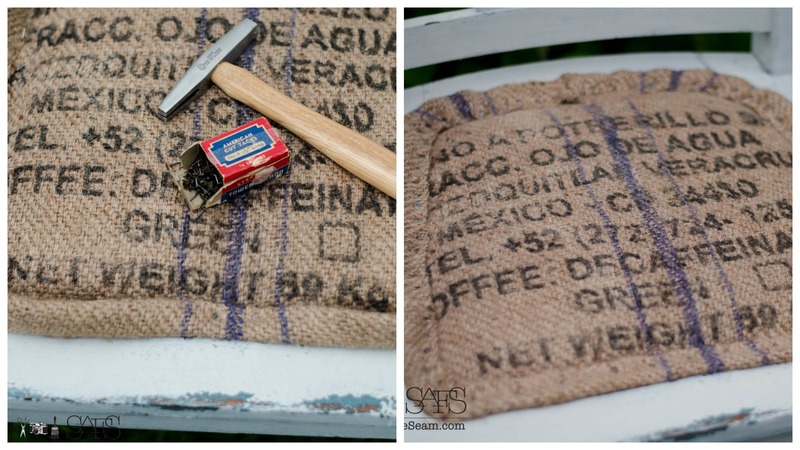 I was working outside on this project as much as possible because I detest the burlap dust and haze in my house! It bugs my lungs. I came up with an idea I thought might work and rolled with it. 6. Fold burlap strip in half length wise, with serged edges even. 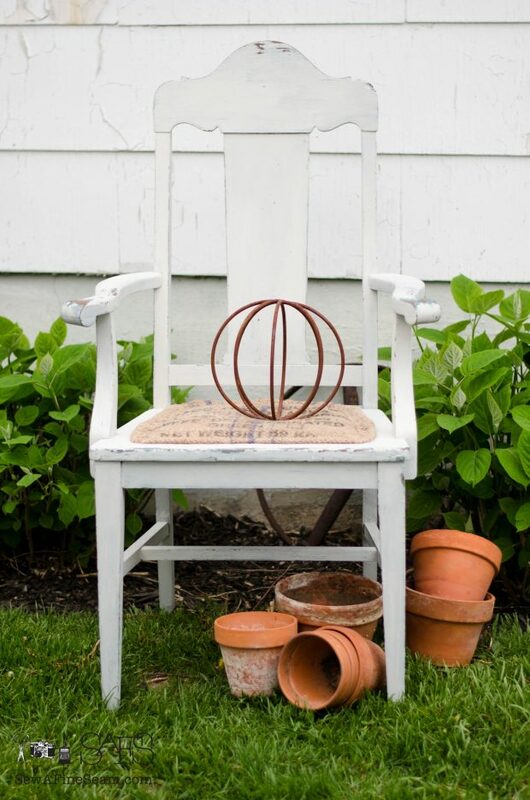 7. staple the serged edges to the edges of the chair seat all the way around. 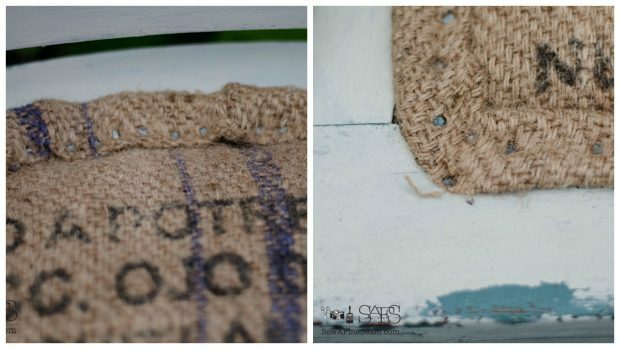 I know the pic doesn’t show it but I ended up putting the edge of the burlap strip UNDER the edge of the burlap seat piece. I started with it on top but didn’t like what it was going to look like when I did my finishing touch so I pulled those first 3 staples and started over – but forgot to get new photos – remember I was racing the light and dry weather! I had thought I would then hot glue the folded edge of the burlap ‘piping’ to the seat. But I happened to think of using upholstery nails for a bit of an industrial vibe. 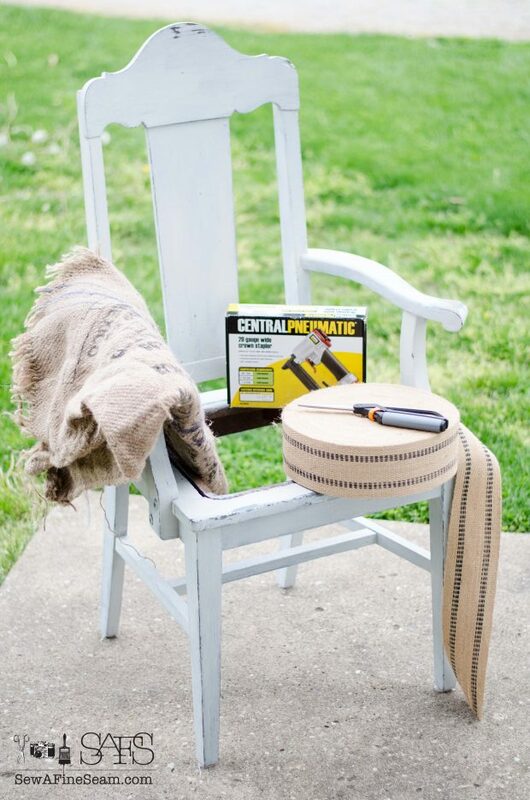 I rather like the look of deconstructed furniture, I had a box of vintage upholstery nails in my tool bag and I have an upholstery hammer, courtesy of my hubby, so I went with it. 8. Turn folded edge of burlap ‘piping’ over the raw edge of the burlap seat. 9. Nail upholstery nails all the way around the folded edge of the ‘piping’. My row is not at all straight – I had to make sure the nail was going into wood so it would stay tight. 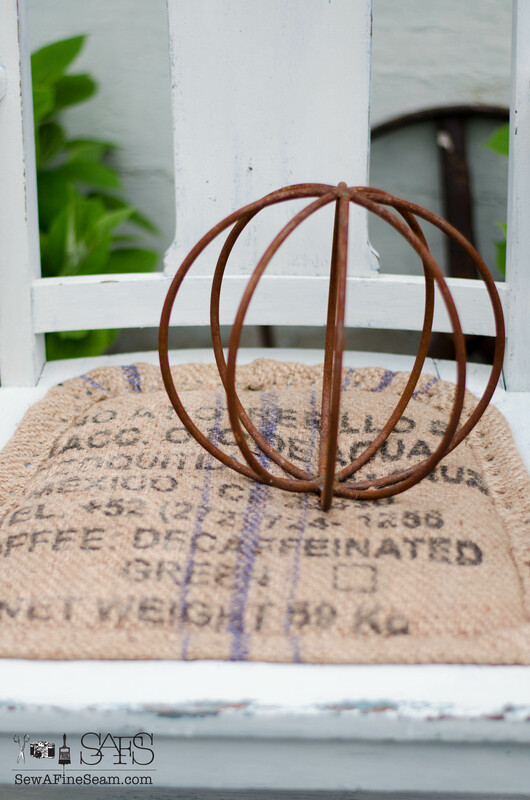 But I rather like the crooked line – goes well with the industrial vibe the nails create and it works with the burlap too. I even added nails on the outside edge of the ‘piping’ where I felt like they were needed. The burlap bunched up a bit along the back of the chair due to the overlap I did where the ends of the strip met. I went with that too. 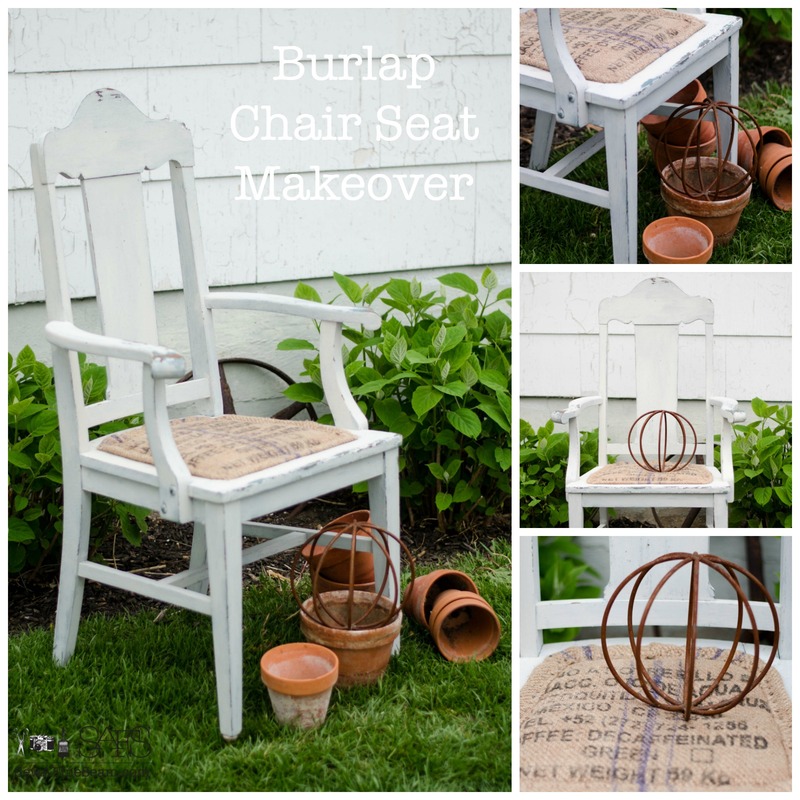 Nothing perfect about this burlap chair seat makeover! 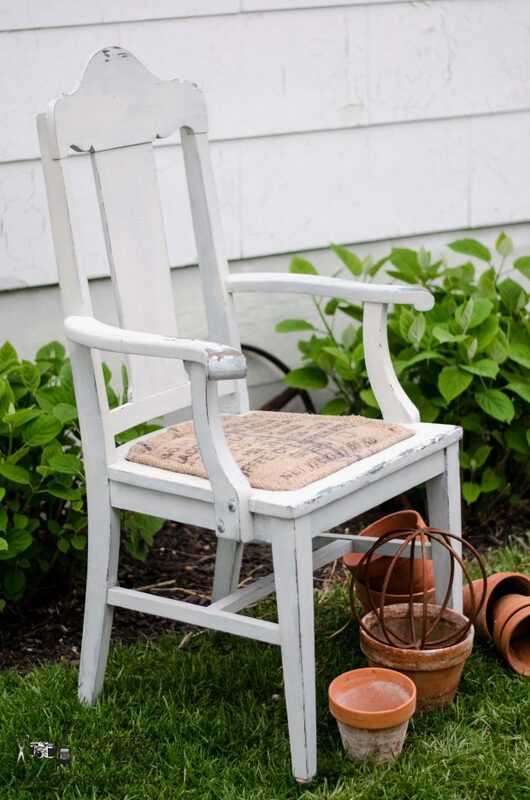 But I think all the little imperfections together, along with the chippy milk paint finish I’d given this chair years ago, make for a delightfully, imperfectly, perfect chair! It’s tempting to tuck this chair back in the corner of my living room! I love it when a project comes together like this and I’m totally happy with the end result! It is in the stack that will be headed to Market next week – if it doesn’t sell maybe it will hang out in my living room awhile longer! And as always, my friends have come up with some fun projects too! Take some time to check them out! Thanks so much my friend! I can’t decide if I hope it sells or not! I certainly understand the temptation to keep it. Sounds like a plan – try to sell it and if it doesn’t – enjoy it till the next sale 🙂 Well done! Beautiful job! I love what you did. Thanks for sharing. Thank you! I love the end result! Love it and I pinned it. I’m loving how it turned out too Michele – so happy I it’s done and that I managed to get it to fit the category for April AND that I was able to join in after all! 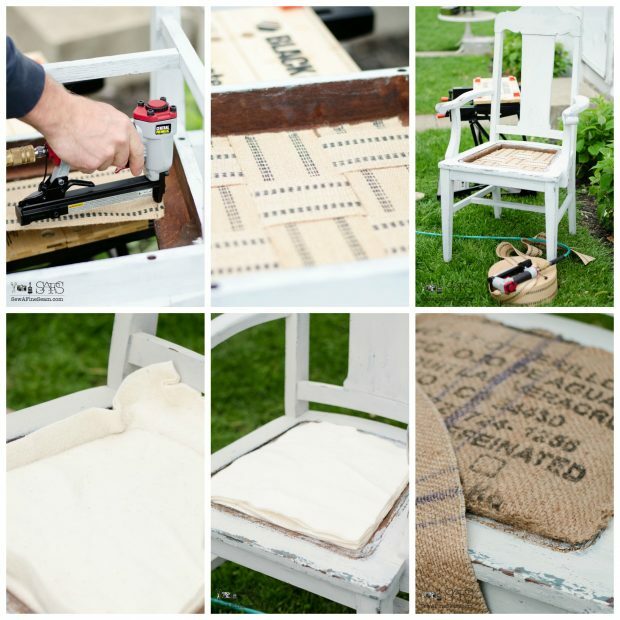 Jill that chair is awesome….I would have never thought of covering it with burlap. Super gorgeous as are all the things you do. Sorry I had to miss this one!!!! Oh, wow! It turned out totally beautiful! How fun! This chair caught my attention Jill. It’s really beautiful. 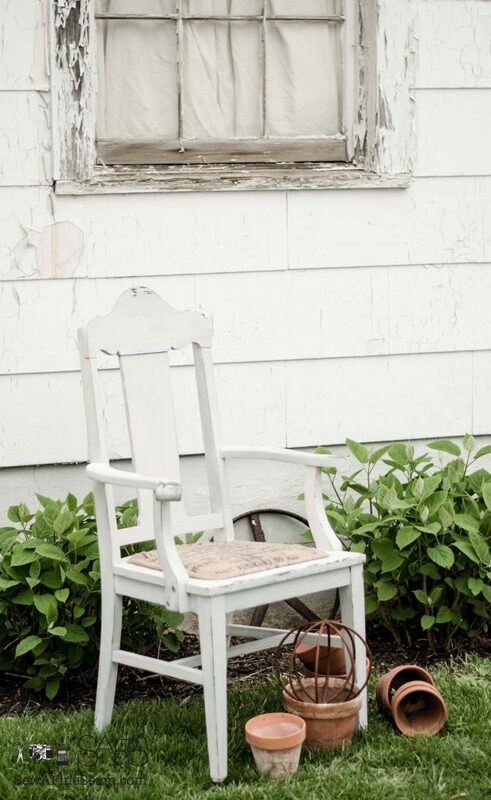 I’m looking for similar chairs to use on my porch, combined with a Swedish bench. Your chair inspired me to move forward with that idea :). I really loved how this chair turned out! It sold at the show I took it to but I would have been secretly happy if it hadn’t and i could have put it in my house for awhile!